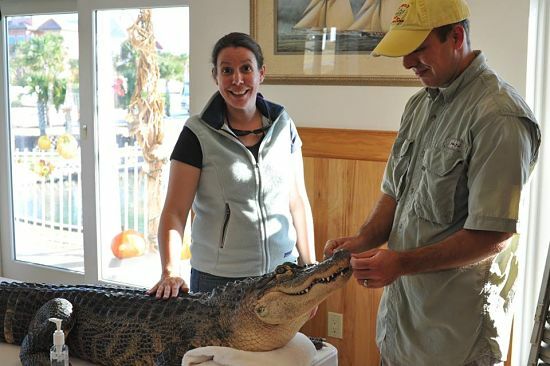 Last fall, when I was camping with my husband in Destin – we had the opportunity to pet an alligator. Now, don’t run off just yet – I was a total skeptic as well. Who in the HELL has a pet alligator? Let me give you the backstory, first. We were camping in Destin at Camp Gulf with some friends and family. Our family left to go home, but I wasn’t ready to leave. We decided to extend our stay a few days at the last minute. My friend Cindy came by our camper and said “Hey! We’re going to see Bubba – want to come? Desi, grab your camera. You’re going to want it”. I thought nothing of it and we happily put on our shoes and followed them to meet this Bubba guy. We’re walking toward the activity center in the campground and my friend is going on and on about Bubba and how he’s never there when they’re staying there – he usually only comes to visit during the summer and the kids love him. So, I casually ask “So, who’s Bubba?” and she replies “He’s an alligator. A live gator that you can pet. The kids love ‘em!” I totally thought she was lying. Come on – is this for real? So, we walk into the activity center and damn sure if she’s right. There’s a @#($@ gator sitting on the table. This guy is petting him and his daughter (who’s around 10 years old) is flitting here and there. 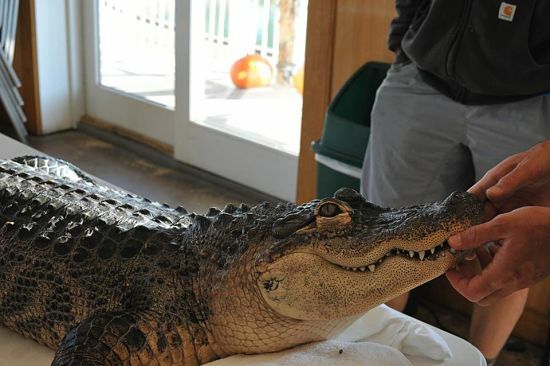 She pets him – the gator is perfectly still. He’s going through his little spiel – talking about his habits, what he eats, how he plays with the dogs in their house. Seriously? This gator is like a pet. His stories were insane and I would have NEVER believed him if I hadn’t seen the gator for my own eyes. Check out those pearly whites! I bet they’re sharp. Even though this gator is right in front of me, I’m still skeptical. I’m starting to think that maybe this is really a joke. Yes, this gator was alive and well, folks. So, I reluctantly touched him on the back. To my surprise, he wasn’t at all prickly – his skin was super soft. I was amazed. I never would’ve expected a gator to be soft. The experience was one I’ll likely never forget. I owe a huge thanks to my friend, Cindy and her husband, Brad. If they had not stopped by our campsite, I would’ve never believed that there was a live gator at the campground earlier that day. 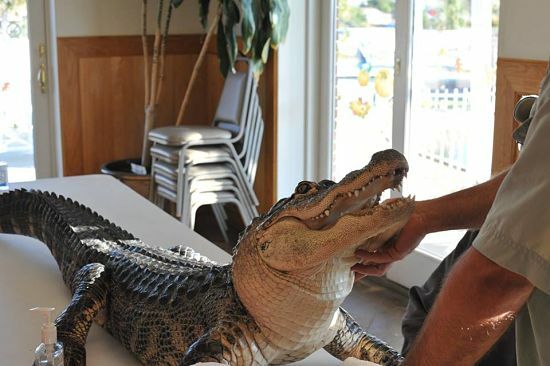 Have you ever touched a gator? Tells us about your gator encounter below.